Christophe Clement was reportedly looking for some class relief for Blacktype (#3), but he doesn’t find it here as this race came up as tough as a minor stakes. He figures to face a challenge from Inspector Lynley (#1), who finished behind him in this spring’s Maker’s 46 Mile, albeit with a tough trip. This Shug McGaughey trainee has shown the ability to take on a horse like Blacktype, but he struggles with consistency. They make a formidable pair, but I’m going to try to beat them both with KHARAFA (#6). 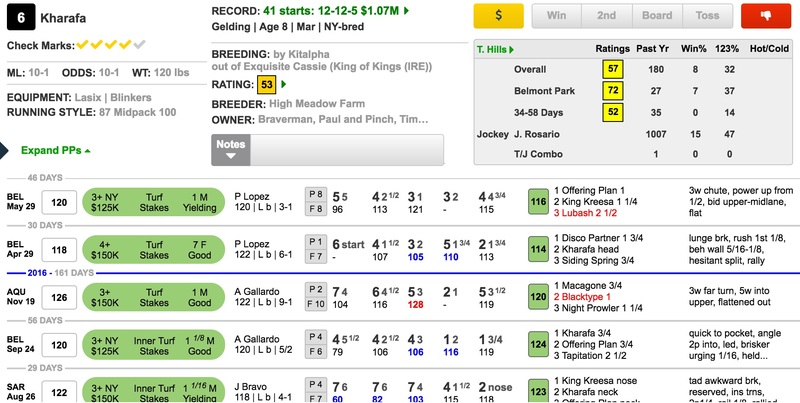 This New York-bred has been successful against open company before, and he has run some of his best races at Belmont Park. I know that his two starts to kick off this season might suggest that he’s gone off form, but I think you can make excuses for both of those races. Seven furlongs is a bit short for him, and last time, he just worked out an uncomfortable trip as Paco Lopez sent him forward to make a prolonged, wide advance toward the leaders without cover. He doesn’t mind a little give in the ground, which he likely will encounter here.